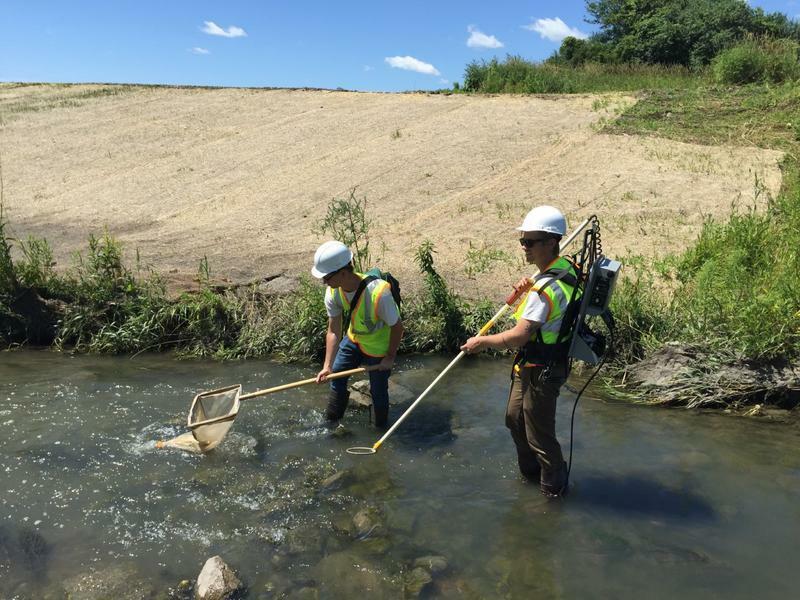 Mount Pleasant Invested Millions In River Restoration; Will Foxconn Be A Good Neighbor? Surveyor assesses stormwater capacity of culvert on stream running through land Foxconn plans to build its factory. The Taiwanese company announced Wednesday it would build its huge LCD screen plant in the Village of Mount Pleasant, just east of Interstate 94. Critics call the state’s $3 billion incentives package exorbitant, others cite environmental concerns. Foxconn will use large amounts of water in the LCD screen manufacturing process, and the state incentives package exempts the company from some environmental regulations. Louis Woo represented Foxconn at Wednesday's announcement celebration. “I think that Foxconn will lead the way in the way it treats the environment here. They want to be globally recognized here. And again, we aren’t going to bend any rules and I don’t think Foxconn is going to ask us to bend any rules,” says Tim Sheehy, president of the Metropolitan Milwaukee Association of Commerce and the Milwaukee 7 representative in Foxconn negotiations. Tim Ehlinger knows a lot about the watershed the company will share. Over the last 25 years, the UWM biologist helped design and monitor a program created to reduce flooding. The flood control program gradually returned the land to a more natural state – similar to what it looked like before farmers transformed it, making it susceptible to flooding. Portion of restored Pike River watershed. 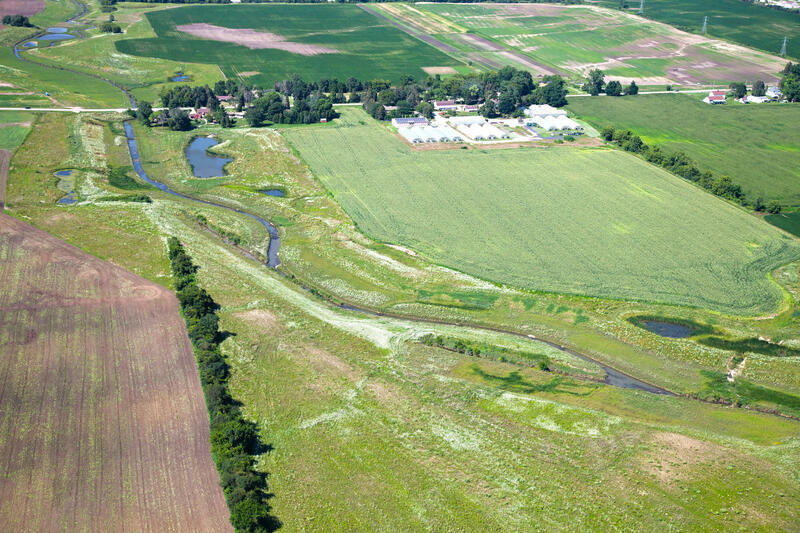 “They took a flood control plan that was based upon conveyance and turned it into a prairie corridor restoration project that was founded upon restoring the ecosystem services that had been here 120 years ago,” Ehlinger explains. It was a $20 million project primarily funded by Mount Pleasant taxpayer dollars. Other funding included the Great Lakes Restoration Initiative, and grants from the Wisconsin DNR and U.S. Fish and Wildlife Service helped build paths and improve wildlife habitat. In transforming the land, project designers created 700 acres of greenspace and more than seven miles of paved trails. Ehlinger says Mount Pleasant residents had a voice as elected officials, the DNR, and engineers worked together to restore the North Branch of the Pike River basin, with the goal of keeping a 100 year flood event within the system. Ehlinger says so far, the flood control effort has worked. "The design was to keep the 100 year flood (a rain event that occurs with the probability of once per one hundred years) within the river corridor. This past summer, the event was above that, some say close to a 500 year event, and the river held the flood waters," he says. Corporations that share the corridor consider it an asset. Ehlinger says they’ve adopted sections of the river to keep it clean, and they promote the paths and natural areas when recruiting new employees. He says he thinks the tone that’s been set could influence how Foxconn treats the watershed. “Given the experience that the citizens of Mount Pleasant have had, given the experience that the elected officials of Mount Pleasant have had, I have great hope and trust that they will have those conversations with Foxconn and Foxconn will talk to the big industries here like S.C. Johnson and Case New Holland and say, 'Hey, this is something that we can be proactive to make sure that we do what’s right for the Pike River Prairie Corridor.'" Elected officials says citizens will have a voice in the process. At the Foxconn celebration Wednesday, Racine County Executive Jonathan Delagrave acknowledged it’s hard to fathom the size and scope of the Foxconn campus. He promised residents they’ll have a chance to ask questions. “In the coming weeks we will be holding three informational sessions throughout the county, where we can share additional details and answer your questions. Let me be clear – we are committed to making sure your input is a part of this process. We are in this together,” says Delagrave. UW-Milwaukee students collecting fish and aquatic invertebrates to monitor the recovery of the restored Pike River. Have an environmental question you'd like WUWM's Susan Bence to investigate? Submit below. It's official: the Racine County community of Mount Pleasant will be home to Foxconn's huge LCD screen manufacturing plant. The company made the announcement Wednesday morning. Mount Pleasant is a community of about 26,000. It's about 25 miles south of Milwaukee and 60 miles north of Chicago. Racine County Executive Jonathan Delagrave says the plant will be a "turning point" for the county. Capitol Notes: Why Did WEDC Hesitate on Foxconn Deal? Gov. Scott Walker had been expecting Foxconn officials to sign a deal with the state any day now. The Taiwanese company plans to build a huge LCD screen manufacturing plant in southeastern Wisconsin, with the help of $3 billion in state incentives. But late last week, the board that will oversee the deal, delayed voting on it. The proposed Foxconn plant for southeastern Wisconsin has been going through various states of approval in recent weeks. Another crucial step could come today with the Wisconsin Economic Development Corporation possibly approving the plan. How Can Wisconsin Schools Prepare For Foxconn, Other Jobs of the Future? Today’s education and business communities talk a lot about “jobs of the future.” What are those jobs? And how are kids being prepared for them? Educators commonly promote the cause of “preparing kids for jobs that don’t even exist yet.” But what does that mean? In Wisconsin, we now have a better idea where employees coming up in the next few decades might find some of those jobs.